Nebra is a conceptual design for an autonomous solar panel cleaning system. Solar energy has gained massive traction in the US in recent years. With the rising price of fuel and falling cost of solar cells, it makes more and more sense to capture energy from the sun -- especially in places with excellent sunlight like the Mojave desert. Another massive growth market we’ve seen recently is that of autonomous flying machines or “drones,” predicted to be a $92 billion industry by 2020. How might we meld these two sectors of rapid expansion? Solar panels lose up to 25% efficiency when dirty. But cleaning them can prove to be a difficult task. Why? It's simple: Location, location location. Solar panels need ample sunlight to operate at maximum efficiency. This puts solar panels up high on urban rooftops, in the middle of hot and sunny deserts, or in difficult-to-reach places where they can catch the sun's rays (think up above a parking lot or the panels we see sometimes mounted to streetlamps). Often it is humans who must enter these harsh environments to clean the panels. Nebra serves to eliminate the dangerous and costly work that comes with cleaning solar panels. Hot, difficult work in remote locations. Specialty equipment needed with cumbersome work that can cause closures or delays. Unsafe working conditions with slip and fall hazards. Cleaning in all these areas is costly and dangerous. Who can benefit from a safer, smarter, and lower cost way to clean solar panels? Energy companies, higher education, and real estate are just a few industries that could save money by investing in a totally automated solar panel cleaning system. Nebra requires few, if any, humans to operate. This keeps labor and insurance costs low. Trucks, hoses, ladders, and the time taken just to get to the places solar panels live adds cost to owning solar panels. All of these factors are eliminated with Nebra. And, since all the units return to the same location after doing their jobs, servicing and keeping Nebra in top-notch shape is simple. Let's take a look. 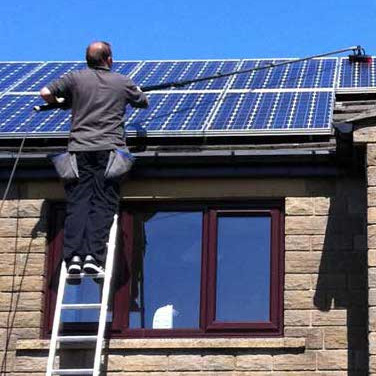 The automated solar panel cleaning system. Drones reside in their pods on an urban rooftop. Nebra only needs occasional human interaction to ensure it is operating at 100%. The system is autonomous and can be monitored from off-site. The charging pod slides open when scheduled. Cleaning fluid is stored in a large container on-site and pumped into the drone before flight. The drone and squeegee bot take flight. Nebra flies to solar panels with low power output. The squeegee bot is placed on the solar panel. Cleaning solution is misted onto the panel. The squeegee bot wipes the panel clean. The squeegee bot is picked up and flown to another panel. Once the task is completed, the drone returns to its charging station. Nebra consists of three parts -- Solar panel cleaning system, quadcopter drone, and charging pod. The solar panel cleaning solution comes as a modular fluid reservoir which locks into the main body of the drone using gravity. What else could drop into the cavity on the drone? Window washer? Litter cleanup? Adaptive lighting system? Package delivery? T-shirt cannon? Medium-altitude weather station? Burrito delivery? Nebra is expandable. Not only is it a solar panel cleaning system -- its modular construction allows it to become any kind of autonomous flying machine. Got a genius idea? Let me know! The result of combining plastic and powder 3D printing with CNC milling, two cans of primer, one pint of automotive paint, four propellers, and some healthy coats of U-Pol #1. Wood was used to join the plastic and powder prints for its ability to absorb adhesives and sand nicely. Small rubber pads were cut and adhered to the base of the legs, so the model sits down with a nice thump. 1/3 scale (14" across). Built in the DAAP workshop of 3D printed plaster, plastic, and CNC milled parts.